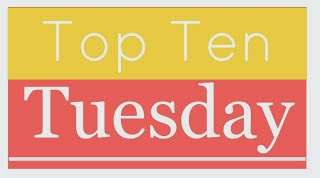 The Broke and the Bookish : Top Ten Tuesday -- Books On Our Spring TBR List! A Court of Thorns and Roses by Sarah J. Maas: I know so many people have already read this, but I'm not one of them and I cannot wait for my copy to get here to so I can meet all of these characters that everyone keeps raving about! The Fill-In Boyfriend by Kasie West: Give me a fake relationship any day and I'll be a happy reader. Especially if it's written by Kasie West, cause she's awesome. The Novice by Taran Matharu: this sounds like the start of an epic fantasy series and OMG that cover is just GORGEOUS! The Invasion of the Tearling by Erika Johansen: I need this in my life after loving The Queen of the Tearling last year! An Ember in the Ashes by Sabaa Tahir: it's a Rome-like world combined with fantasy goodness, OF COURSE I'M IN! The Shadow Cabinet by Maureen Johnson: I've been waiting for this one to come out since I read the last book in the series, The Madness Underneath. I was super disappointed in the ending of that one, but I was told by a very reliable source that this one was better. Here's hoping! Jackaby by William Ritter: I started this one a couple of months ago and enjoyed it, but things happened and I put it down for a bit. Then I saw it was going to be a Forever Young Adult book club pick in a few months, so I figured I'd wait to read it until then. It's sort of like Sherlock Holmes, but with paranormal stuff, a female Watson, and in late 19th-century America. The Winner's Crime by Marie Rutkoski: I LOVED The Winner's Curse, and can't wait for the next one! I've had it for ages, I've just been so busy with school. Next week is Spring Break for me, and I plan to enjoy it! The Heart of Betrayal by Mary E. Pearson: Pretty much ditto to my reasoning above. The Kiss of Deception is one of my favorite books ever, and I'm planning to read this one as soon as I'm done with my current read! The Orphan Queen by Jodi Meadows: I've been hearing that this book might ruin me, but I love Jodi so much that I don't even care! The Shadow Cabinet was definitely better than The Madness Underneath. Enjoy! DAisy, three of your books are on my list, too, and ACOT&R was SO GOOD. Great picks! HAven't heard of THE NOVICE, so I'd better look it up since I approve of the others! Tahleen, JACKABY is on my nigthstand right now! It came with THE WITCH'S BOY for review, and that one DID make my lits. hopefully both will happen this spring! Jana, great choices! I've read all but TWC, and I want to do a re-read of that story! A Court of Thorns and Roses & An Ember in the Ashes areon my list too! And I have read The Novice - it's great. I have both A court of thorns and The Winners Crime to read but just haven't got to them yet. I loved the winners Curse so I don't no why am putting it off. I've only read the first book in that series by Maureen Johnson. Looking forward to the next two. I can't wait to read a bunch of these as well. The Winner's Crime, A Court of Thrones and Roses, An Ember in Ashes? Yes please! I still need to read The Winner's Crime too, though it might be summer before I get to it. So many good books coming out this Spring!!!! I've seen the Winner's Curse/Crime books EVERYWHERE, and really think I need to get on that! Nice list! I read THE SHADOW CABINET last month and enjoyed it. Love this series! I should have put down A Court of Thorns and Roses by Sarah J. Maas! I can't wait to read that one! I'm also excited for A Court of Thorns and Roses. And Tahleen, Jackaby was awesome, you'll love it! ACORT!!! I need that book ASAP!!! So many of mine overlap yours! Wow! And yeah... your books reminded me of all the reading I am behind on right now, but seriously, great books recommended all around. I'm extremely interested in The Invasion of the Tearling! I was really iffy on Queen of the Tearling, so I'm intrigued to see if I'll enjoy this one more.